TV show dates: December 10, 2017 — February 17, 2019. Performers include: J.K. Simmons, Olivia Williams, Harry Lloyd, Ulrich Thomsen, Nazanin Boniadi, Nicholas Pinnock, Sara Serraiocco, Mido Hamada, Jamie Bamber, Kenneth Choi, and Bernhard Forcher. A sci-fi espionage drama from creator Justin Marks, the Counterpart TV series delves into an enigmatic reality which everyday living conceals. The story centers on low-level bureaucrat, Howard Silk (Simmons), who toils away in relative obscurity at a United Nations spy outfit based in Berlin, Germany. After uncovering evidence that his agency is protecting a secret about traveling to a parallel dimension, Howard’s whole life changes. He soon plunges headlong into a strange world fraught with peril and treachery. In that other dimension, the only person Howard dares trust is his own counterpart. Meanwhile, Howard’s wife, Emily Burton Silk (Williams), has secrets of her own that may well connect to everything. Likewise, the mysterious Clare (Boniadi), may prove key to what is truly going on. Howard’s isn’t the only one dragged into the intrigue. His director, Peter Quayle (Lloyd), also gets caught up and finds his double life is wreaking havoc with his meticulously plotted career. Overseeing Counterintelligence at Howard’s agency is Aldrich (Thomsen). This seasoned operative is one part philosopher and one part spy. Ian Shaw (Pinnock) has the unenviable responsibility of keeping the peace between the two dimensions. Finally, there’s Baldwin (Serraiocco). Her life, as well as her work as an assassin, takes on a whole new significance, once she comes into contact with the other side. Counterpart wonders, “What if our lives could have been different?” From that angle, the thriller examines the concepts of identity, fate, and opportunity lost. Mira’s looming threat forges some unlikely alliances. First aired: February 17, 2019. What do you think? Do you like the Counterpart TV series? Should this Starz TV show have been cancelled or renewed for season three? 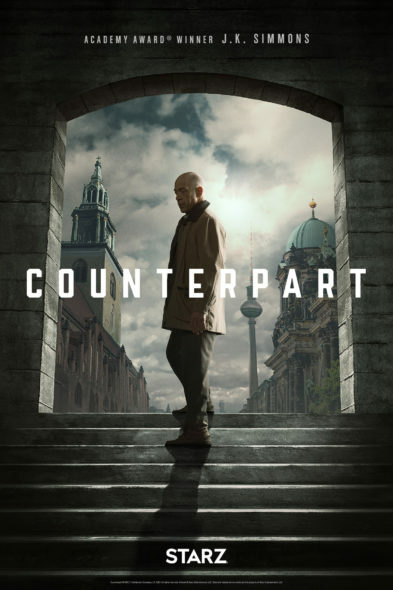 More about: Counterpart, Counterpart: canceled or renewed?, Counterpart: ratings, Starz TV shows: canceled or renewed? RENEW this show. Excellent program… Will be missed unless picked up by another channel. I have this show on my list to watch….does season 2 end in a cliff hanger or were they able to “end” the series? No point in watching if I’m just going to be left hanging…. It should continue. Thoughtful plot, excellent acting, intelligent writing. I really liked this show and I’m very disappointed and surprised that viewership fell off. They should certainly make a third season, focussing to centain the the flu in Berlin and because of the sorry state of the German statee for serious risks and because American military personal some of higher rank, but also many tourists, from many other countries. Berlin would be completely sealed off by technically NATO but pretty much the USA, which makes things much harder to keep secret, especially as Management was killed. Bad decision by Starz, and nobody will pick it up. An Absolute shame. Continue Counterpart to season 3! !